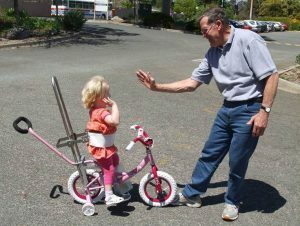 Volunteer Profile: Des Chabrel - TADSA - Technology for Ageing and Disability (SA) Inc.
Des Chabrel joined TADSA in 2007 and for the last nine years has concentrated on modifying bikes for our Freedom Wheels bike program. He has also been involved in developing accessories including small Outriggers wheels (like trainer wheels) for 12” bikes, a rear steering system and a hand crank system for a client who uses her hands to ‘pedal’ her bike. An unusual modification Des made to a bike was to fit a motor to allow the client to ride through rough terrain in the Kuitpo Forest. Des is a keen bike rider himself and still competes in triathlons. Running is also a sport Des enjoys and he has even competed in two London marathons (the New York marathon is on his ‘bucket list’). Des is pictured below at the recent KYD-X expo. The pink bike is one of Des’s projects. Des joined TADSA as a Volunteer because he wanted to give something back to the community. After participating in general committees like his children’s school council and scout group, he wanted something more hands on when his working career was coming to an end. 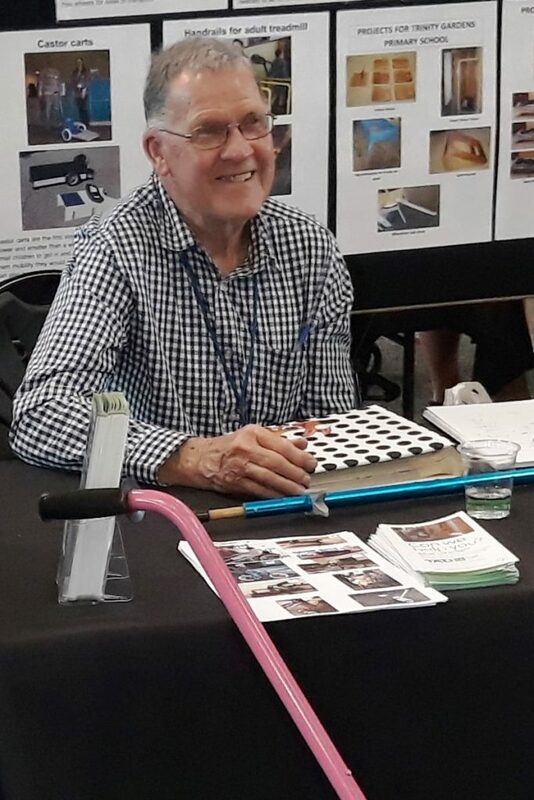 Des found TADSA while attending a Disability Expo with his friend the late Fred Stace who also became a TADSA Volunteer. After leaving school Des trained as a draughtsman with the Engineering and Water Supply Department (E&WS) in the Riverland. He later moved to Adelaide to study while still working for the E&WS. Des was later promoted to a Technical Officer and then Project Manager working on civil construction in particular reinforced concrete and structural steel. He produced detailed drawings for pumping stations and related out buildings. Des modified a bike for a young client who cannot pedal in the regular way. He had seen a video of her at one of TADSA’s bike clinics and noticed that she was able to exert downward pressure with her legs. 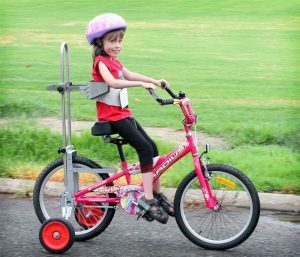 Using this information, Des designed and built a system to enable the client to pedal. By replacing part of the bike chain with a spring and facing both pedals forward the client could pedal by pushing both feet downwards at the same time. This treadle action is similar to the way early sewing machines were powered. Des says that seeing the client being lifted out of her pram, getting on the bike and riding for the first time “blew me away”. The modified bike is pictured below left and at right is another of Des’s happy clients.